Pa‘ē mai ana ka leo o ka pahu, ‘o ke ao hou nō ia. The sound of the pahu is heard from afar, it is indeed a new dawn. Sending aloha to you and your family this holiday season. *Ōlelo Hawai‘i message written and translated by Ākeamakamae Kiyuna. 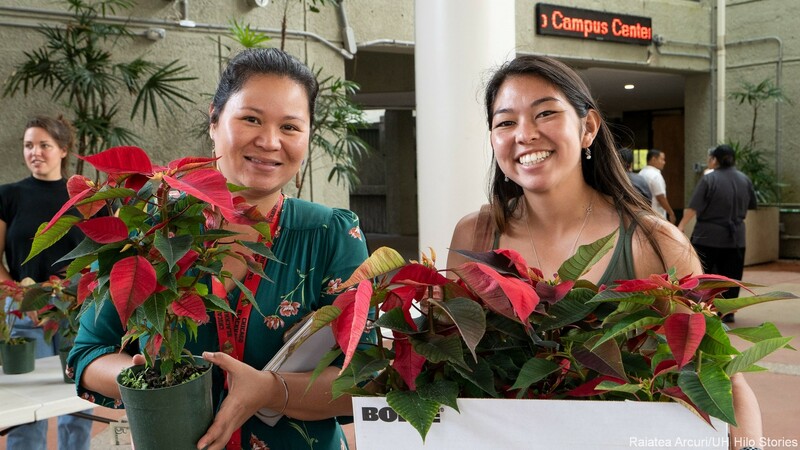 Above photo: Happy customers at the sold-out annual poinsettia plant sale, Campus Center Plaza, UH Hilo. The plants are grown by students of the College of Agriculture, Forestry, and Natural Resource Management. Nov. 28, 2018. Photo by Raiatea Arcuri. As we start the holiday season, I reflect on the amazing and talented people who are part of our university ‘ohana, and I’d like to share with you some of the accomplishments of the past semester. Incoming Freshman Class, August 2018. We started our new academic year with The Chronicle of Higher Education’s 2018 Almanac ranking the University of Hawai‘i at Hilo as the most diverse four-year public university in the United States. 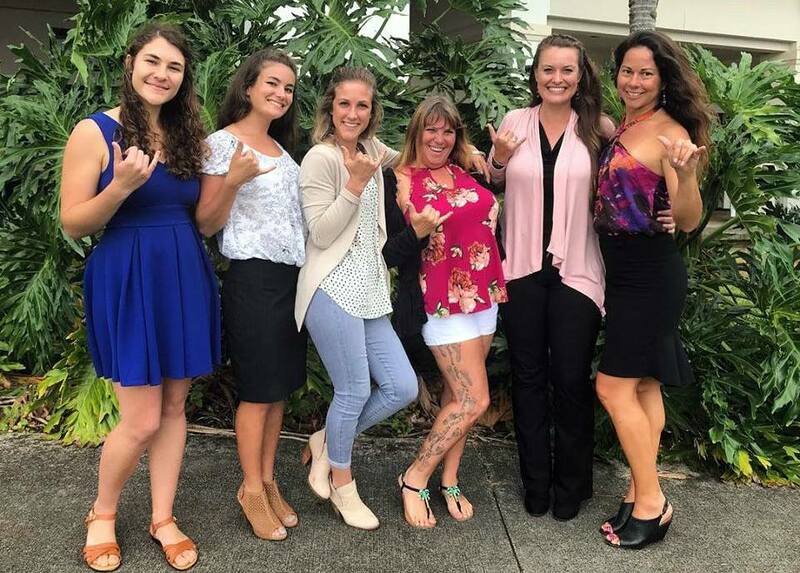 The cultural and ethnic diversity found in our university ‘ohana strengthens everything we do in teaching, research, and outreach, and prepares our students to be productive citizens in the real world. 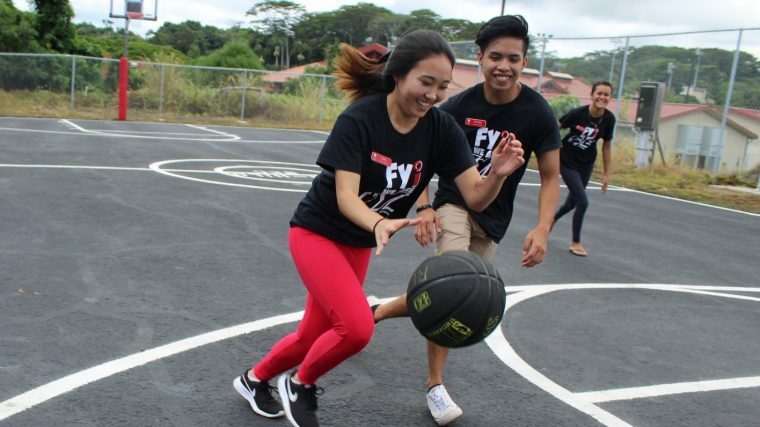 Students play at the renovated court. We also started the semester with two new outdoor gathering spaces for our students: a newly renovated basketball court behind Auxiliary Services complete with a grill and several covered picnic tables with solar powered e-recharging stations, and covered solar recharging stations outside the Student Services building. The new spaces, complete USB charging ports and Wi-Fi access, were built through a great collaborative project with students from the carpentry program at Hawai‘i Community College. A team of our genetic researchers studying the ‘alalā (Hawaiian crow), led by biologist Jolene Sutton, published their work describing the high-quality reference genome that was generated to assist recovery efforts for the endangered bird. Researchers Martin Helmkampf and Renee Bellinger, along with collaborators from the Hawai‘i Endangered Bird Conservation Program, San Diego Zoo Global, and Pacific Biosciences, all contributed to the project. This is an extremely important contribution to the world of conservation genetics. The genome assembly is now publicly available. And our conservation biology students also made headlines. 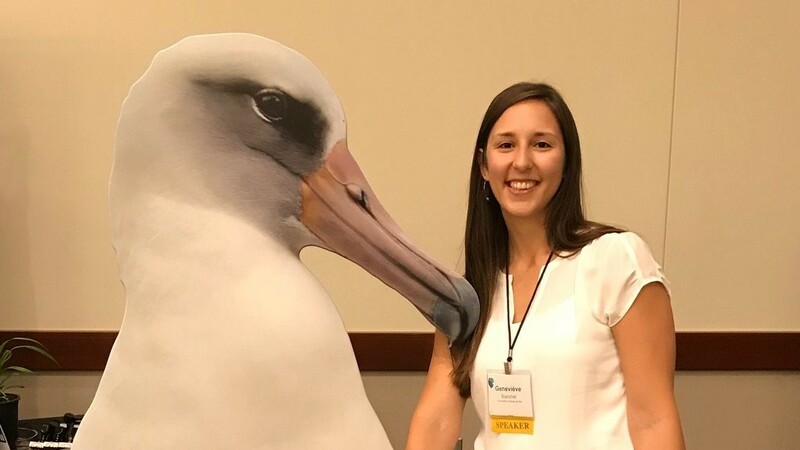 A group of our graduate students in the tropical conservation biology and environmental science program presented their work at the 25th Annual Hawai‘i Conservation Conference held in Honolulu. 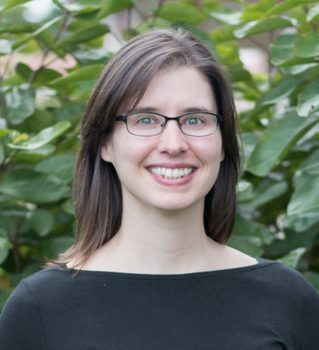 Two of the students came home with honors: Geneviève Blanchet was awarded Outstanding Graduate Student Oral Presentation, and Koa Matsuoka was awarded Runner-Up for Outstanding Graduate Poster Presentation. 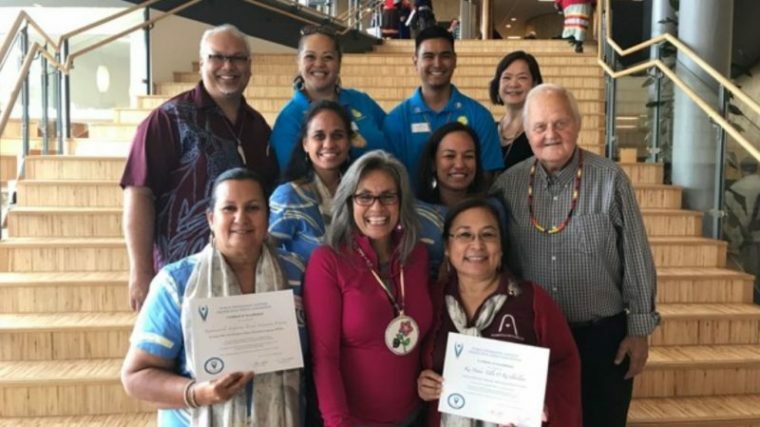 UH Hilo group at Sami University of Applied Sciences, Norway, for accreditation recognition from the World Indigenous Nations Higher Education Consortium. The Kahuawaiola Indigenous Teacher Education Program received accreditation. 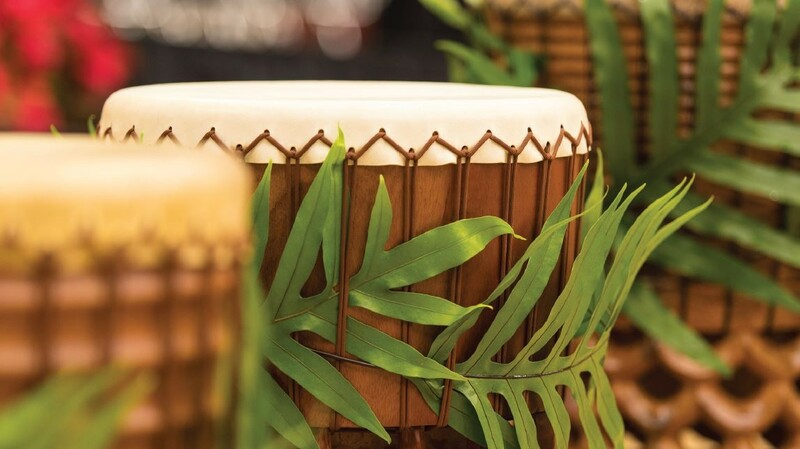 The UH Hilo graduate certificate program is the first teacher education program in the world to receive accreditation from the prestigious international authority, the World Indigenous Nations Higher Education Consortium. The consortium also renewed accreditation for the UH Hilo Ka Haka ʻUla o Keʻelikōlani College of Hawaiian Language. Keiki Kawaiʻaeʻa, director of the college, and all faculty and staff of the college are to be congratulated for their hard work in making UH Hilo’s language and culture revitalization program a model for the world to follow. 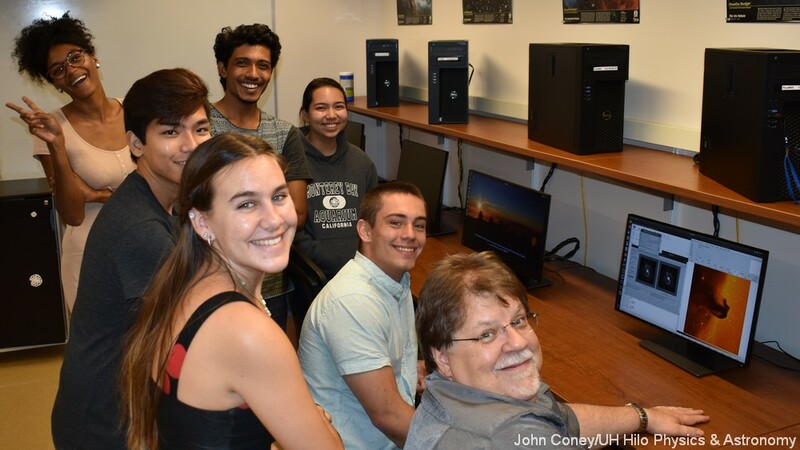 Students and researchers in the physics and astronomy program celebrated the installation of 12 brand new high-end desktops and monitors, along with a new data processing and storage Linux computer system, thanks to a generous donation by the Thirty Meter Telescope International Observatory. The TMT gift totaled over $28,000 in equipment, supporting the replacement of 10 aged computers purchased in 2010 that no longer met department needs. UH Hilo launched its long-planned data science program this fall by offering a certificate in the fast growing field. Program Director Roberto Pelayo says the program is filling a need in the state because almost every branch of science collects massive amounts of data, but there are not a lot of trained people able to analyze that data and make conclusions—for example, here on our island, in conservation efforts, water resource management, and climate change impacts. The data science certificate is open to all students, regardless of major or background. Computer scientist Travis Mandel, mathematician Grady Weyenberg, and colleagues across many branches of science put in untold hours to create this new data science program. 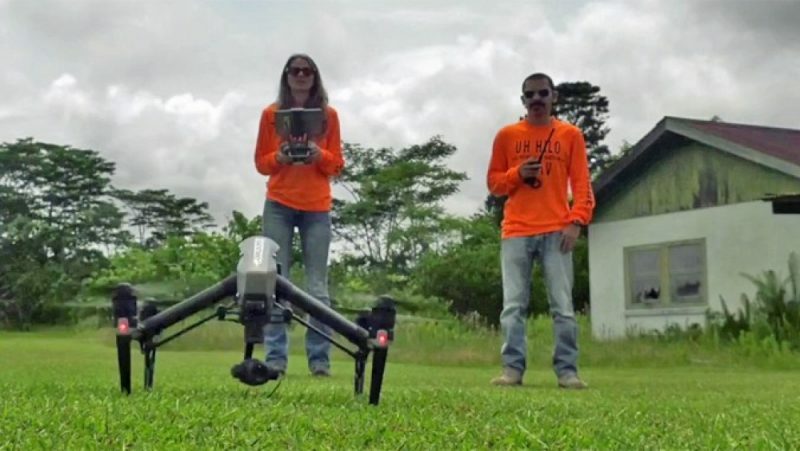 UH Hilo drone team took a lead role in collecting data during the recent lava flow in Puna. Photo via UH System News. Last month, a new aeronautical sciences degree program was approved by the UH Board of Regents. The provisional bachelor of science program has two concentrations: one in commercial professional pilot training, and another in commercial aerial information technology (which utilizes drones), where there is a high projected workforce need in the state. Ken Hon, interim vice chancellor for academic affairs, and Bruce Mathews, dean of the College of Agriculture, Forestry and Natural Resource Management where the program is housed, achieved a major milestone in bringing the program to life. 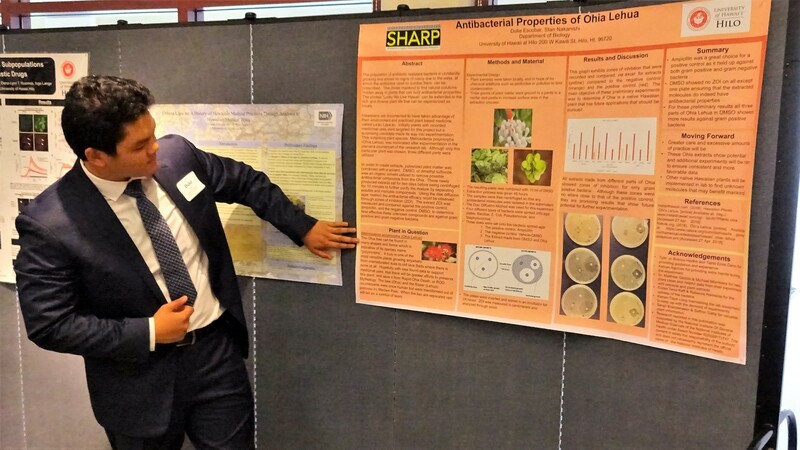 These are just a few of the exciting accomplishments of the semester that provide positive learning experiences for our students, conduct important research for our environment and communities, and expand outreach to improve the quality of life for everyone. Mahalo to all of you for your contributions. Sending aloha to you this holiday season. 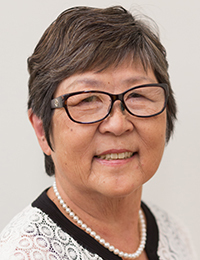 University of Hawai‘i at Hilo Interim Chancellor Marcia Sakai presented the UH Hilo Enrollment Management Report to the UH Board of Regents on Nov. 1, 2018, at the UH Mānoa campus. Here is the text of her PowerPoint presentation to the BOR. *2 Increase of #.# percentage points to the retention rate in the second fall semester of enrollment, decaying by 0.1 percentage point through fall 12. *1 Data from UH IRAO Tracking system – numbers will not tie to other sources. *2 Direct entrants are students who enrolled in college directly from high school without delay after high school graduation. *3 Data from IRO Base, Census; includes classified undergraduate students only. *4 First-time freshmen and transfers retained from prior fall semester tracking cohorts. More information and documents are on the UH Hilo Enrollment Management website. National events of the last two weeks have furthered the resolve of the UH Hilo community to be unflinching in its commitment to embrace diversity and inclusion on our campus while fostering and practicing the spirit of aloha in all that we do. 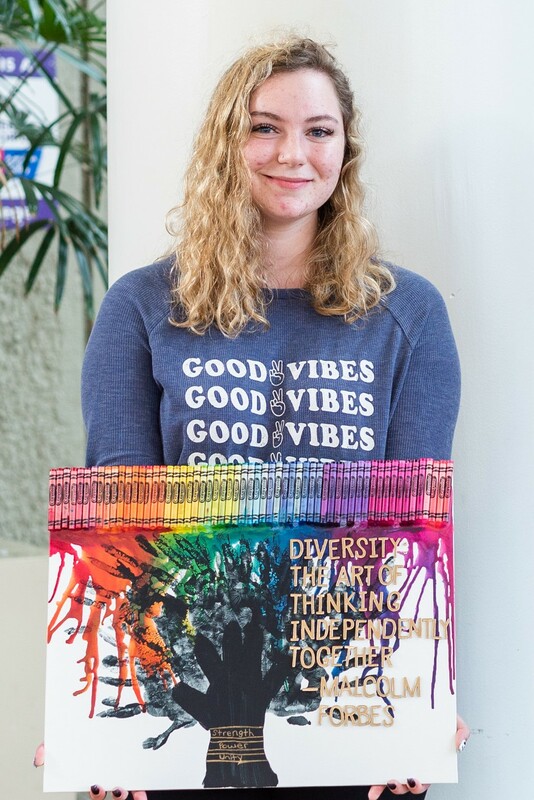 Allison Dupre holds her winning mixed media piece, The Diversity Tree. Learn more about the artwork and Ms. Dupre’s $500 prize. Photo by Raiatea Arcuri, click to enlarge. At UH Hilo we take pride in our diverse campus community, and embrace all who come here to work, study, and grow. Universities are places where ideas and cultures intersect, and we strive to ensure this is a place where the exchange of diverse ideas can occur in a safe and productive environment. 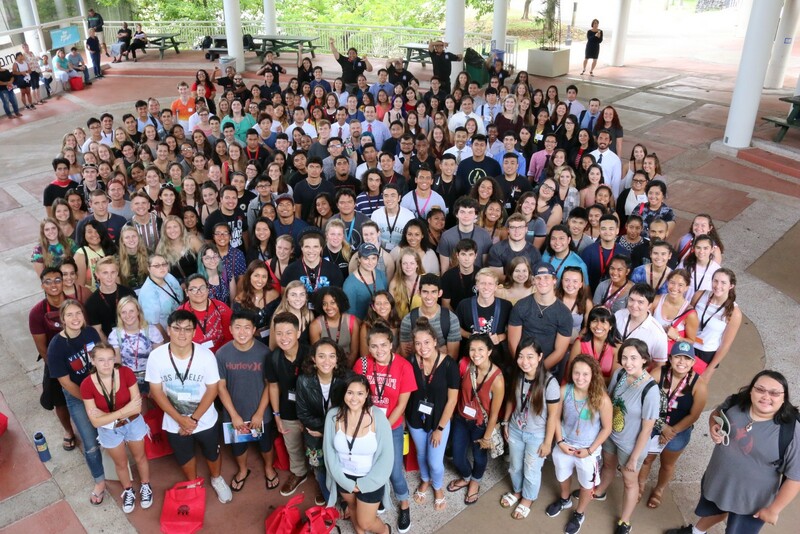 National events of the last two weeks have furthered the resolve of the UH Hilo community to be unflinching in its commitment to embrace diversity and inclusion on our campus while fostering and practicing the spirit of aloha in all that we do. I ask that each of you make a personal commitment to do your part to ensure our campus is a place where our differences can make us better, within a framework of respect and aloha. As the most diverse four-year university in the country, we serve as an academic model to the world where people from across the globe live in harmony, thinking independently together. Mahalo for caring for each other.